1. Access to a standardized core set of mental health and addictions services across Ontario. A core set of provincewide mental health and addictions services should focus on providing seamless programs and support across the lifespan, from children and youth to adults and seniors. Another focus should also be placed on enhancing substance use and addictions treatment programs for Ontarians. Core services will ensure consistent treatment delivery across Ontario, reduce emergency room visits, help patients navigate the system and lead to better health outcomes. A net-cost analysis of the above example estimated total health care savings to the health system of approximately $71,000, factoring in expenses to run the clinic. Several CMHAs, including CMHA Brant Haldimand Norfolk, CMHA Middlesex, CMHA Peel Dufferin and CMHA Simcoe County provide services through RAAM clinics. Furthermore, CMHAs support the implementation of Consumption and Treatment Services as cost-effective means to reduce fatal overdoses and prevent illnesses. 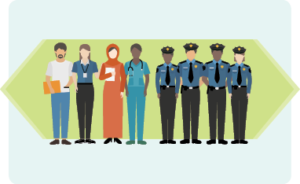 There are many challenges facing community-based agencies in this area as many agencies lack capacity as well as financial and technical resources for data collection. Further investments are needed to build the data infrastructure of the community mental health and addictions sector. Without valid, comparable, consistent data, we cannot adequately measure our performance. And without effective performance measurement indicators, we cannot improve the quality of our performance. 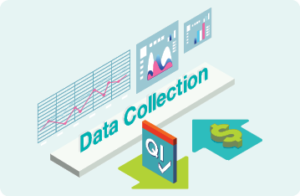 Quality improvement initiatives cannot succeed without this necessary data infrastructure. The first step is to invest in a data strategy for the entire community-based mental health and addictions sector. Many CMHA branches across Ontario are leading the path to continuous health quality improvement. Often, they are doing this in conjunction with CMHA Ontario, which co-leads the Excellence through Quality Improvement Project (E-QIP). E-QIP provides quality improvement education, training and resources, and builds capacity within the mental health and addictions sector. The project ensures dedicated and skilled service providers have the support they need to improve the quality of care they offer to clients. 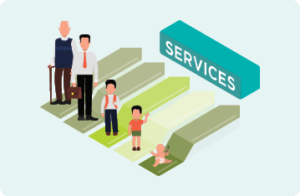 E-QIP provides coaching to health service providers to help streamline health service delivery and implement cost-effective and efficient methods to enhance service provision. Supportive housing is consistently identified as one of the top priorities by our local CMHA branches. Provincewide, CMHAs provide about 30 per cent of all the mental health supportive housing units and nearly 20 per cent of the total residential addiction support. CMHA’s supports the goal of an additional 30,000 supportive housing units across the province over the next 10 years. Supportive housing provides an anchor for life. Research indicates that having a place to call home means a better quality of life and success in education and work. It improves outcomes from even severe mental health and addictions problems. Supportive housing can also decrease problematic drug and alcohol use and it has the potential to improve physical health and social inclusion. Evidence from the nationwide housing-first demonstration project, At Home/Chez Soi, found that overall supportive housing resulted in substantial reductions in overnight stays in shelters and fewer stays in institutions such as hospitals, correctional facilities and addiction treatment facilities. Every $10 invested in housing-first services resulted in an average reduction in costs of other services of $9.60 for high-needs participants and $3.42 for moderate-needs participants. 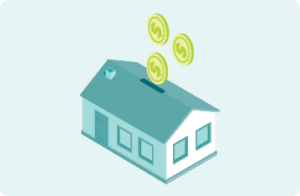 Over a two-year period, every $10 invested in housing-first services resulted in an average savings of $21.72. 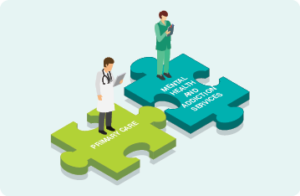 Increased support is needed for joint primary and mental health and addictions integrated care models that work to address the physical and mental health and addictions needs of Ontarians. Such cost-effective, community-based primary health care and mental health and addictions services reduces pressures on hospital emergency departments. One example that combines primary care with mental health care is CMHA Ontario’s BounceBack program. BounceBack is a unique, telephone-based psychotherapy program available across Ontario designed to help adults and youth 15 and older to manage symptoms of depression and anxiety. Access to the program is by referral from a family doctor, nurse practitioner or client self-referral. If clients submit a referral themselves, their primary care provider is notified and kept informed of their progress in the program. There’s no waiting period for BounceBack and the program is free to people living in Ontario who have a valid health card. Once a referral is submitted, clients who are accepted into the program are contacted by a BounceBack coach within five business days to start the program. BounceBack is shown to reduce a person’s symptoms of depression and anxiety while improving their emotional wellbeing and quality of life. The program has also shown to reduce avoidable use of hospital and emergency department resources, thus helping to end hallway medicine. MCITs are one component of mental health and addictions-related crisis support that several CMHA branches currently provide across Ontario. The unprecedented $1.9 billion investment in mental health and addictions must be directed to sustain existing community-based services and to develop new evidence-based, cost-effective programs to meet the increasing needs of Ontarians. This historic provincial investment provides a unique opportunity for government to engage with our community-based mental health and addictions sector. We are an integral partner that can help end hallway medicine and relieve the pressures on hospital emergency departments and the criminal justice and social services system. Lamanna, D., et al. (2015). Toronto Mobile Crisis Intervention Team (MCIT): Outcome Evaluation Report. Toronto, Canada: Centre for Research on Inner City Health, St. Michael’s Hospital. See also: Kisely, S., et al. (2010). A controlled before-and-after evaluation of a mobile crisis partnership between mental health and police services in Nova Scotia. Canadian Journal of Psychiatry, 55(10), 662-668; Saunders, J. A. & Marchik, B. M. A. (2007). Building community capacity to help persons with mental illness: A program evaluation. Journal of Community Practice, 15(4), 73-96; Baess, E. P. (2005). Integrated Mobile Crisis Response Team (IMCRT): Review of pairing police with mental health outreach services. Victoria, Canada: Vancouver Island Health Authority; Tacchi, M. J., et al. (2003). Evaluation of an emergency response service. The Psychiatrist, 27, 130-133; Scott, R. L. (2000). Evaluation of a mobile crisis program: effectiveness, efficiency, and consumer satisfaction. Psychiatric Services, 51, 1153-1156. 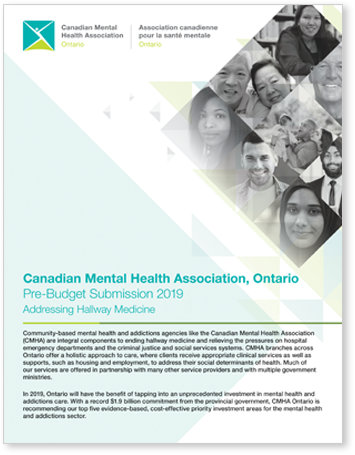 CMHAs across the province recommend a three per cent base budget increase for the community mental health and addictions sector, which provides front-line services to nearly 500,000 Ontarians. CMHA branches, for example, have gone without significant budget increases in as many as eight years. In the past, any new investments have almost always been tied to delivery of a specific program and not to overall operations. As a result, our sector continues to struggle with staff retention, rising hydro costs and administrative expenditures that impact service delivery. A base budget increase is crucial to sustain our service delivery capacity and meet growing demands.